Start your preparations for your trip to Asuncion by reading the most recent information about the city, it's places of interest and attractions. Asuncion is a relatively small, old city - home to approximately 500,000 people. Despite the city being technically small, the urban center has bled out significantly and the population of the sprawl is closer to 2 million. Settled by Spanish invaders centuries ago, it became the hub of a vast colonial province. As time went on the city attracted immigrants from across Europe, the immigrants shaped the growth of the city, which has expanded and shifted significantly over the last century. Asuncion’s climate is tropical and humid with mild winters. In Paraguay the majority of people speak Spanish, and its capital Asuncion is no exception with 57% of the population conversing in Español. That said, the indigenous language of Guaraní and its pidgin cousin Jopará, are both widely spoken languages too. This is a colorful and friendly city with a long and interesting history. Find yourself in immersed in downtown street life, and grab a chipa caburé on your adventure, or explore the modern parts of the city, with tall buildings, flourishing businesses, and all important air-conditioning during the scorching summers. Asuncion lies on the Argentinian border, almost opposite the Argentine city of Clorinda, Formosa. It’s also one of the oldest cities in South America. Sitting on the bank of the Paraguay River, the low expanse stretches along the waterside, littered with skyscrapers and tower blocks. How to get to Asuncion? Silvio Pettirossi International Airport is the main hub for the visitors that arrive to the city. A cab ride to the city center costs about $25. Asuncion is a heaven for history buffs with countless historical buildings, museums, and galleries. If you want to relax after you finis your daily excursions, you can have a rest at pubs and nice restaurants, which are abundant in the city center. 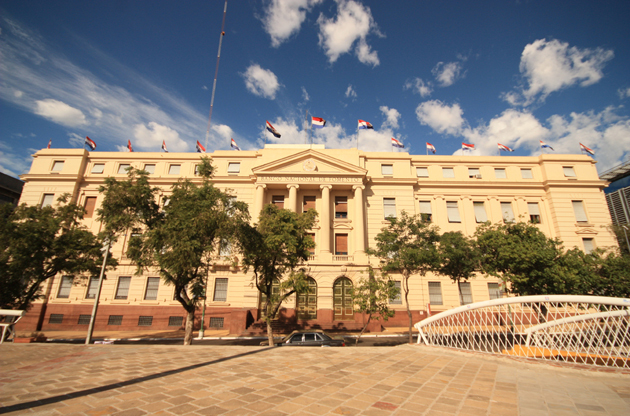 Paraguay won its independence in 1811. The secret HQ of the coup rebels was in downtown Asuncion. Today it’s a museum and historial site that you can visit, known as Casa de la Independencia (House of the Independence). Taking you even further back in the history of Paraguay is the Museo Del Barro – housing an impressive display of indigenous and rural art. For a lunchtime picnic or a romantic stroll, the Cerro Lambaré is famous for its blossoming lapacho trees, climb the hill and look out over the city. For the outdoorsmen among you, Asuncion boasts plenty of beautiful parks and green spaces such as the Parque Independencia or the Parque Carlos Antonio López. If you want to shop, Calle Palma is a great place browse while seeing authentic parts of the city - stopping off at cafes, plazas and landmarks. A little exploring around this area will find you more bargains, and great street food vendors. As well as a great selection of small shops, the city has large luxury malls such as Shopping del Sol, or the Mall Excelsior, with international brands and bargains. To shop where the locals shop, try the Mercado 4 market; you can find anything from food to fashion and the usual Paraguayan souvenirs – lace, leather, and Bombillas. For a bite to eat at any time of day, try one of the city’s most revered restaurants - Restaurante Bolsi. Everything from breakfast to dinner is great quality, and with a broad choice of cuisine, it’s great for entertaining international clients or locals. If you’re out late and need some food, try Tierra Colorada, where you will dine with the locals and taste some great gourmet fusion food - traditional Paraguayan with a European twist. It has a great atmosphere, friendly staff, and good wines. 65% of Asuncion’s population is under 35 years old; this makes the Capital and extremely young city. The nightlife is lively and modern, and is found in several different areas - the downtown part of the city is home to the sleek bars and restaurants you might wish to visit for business or for a formal evening out. If you want to get a taste of real Asuncion after dark though, try one of the party neighborhoods; Manora and Las Carmelitas, where the drinks never run dry, and the music never stops. If you’re visiting the Presidential Palace, head to the nearby Manzana de la Rivera, to take a peek at restored tradition homes that you can explore, and learn more about the country and its capital. There’s an old railway station here that can take you to neighboring cities of Luque and Areguá. Many international congresses, conferences, symposiums, exhibitions, tradeshows and fairs take place throughout the year in the capital. Thanks to the nice aura of the city and the quality of the hotels as well with the venues, Asuncion is becoming a better place to hold these sort of large scale events.